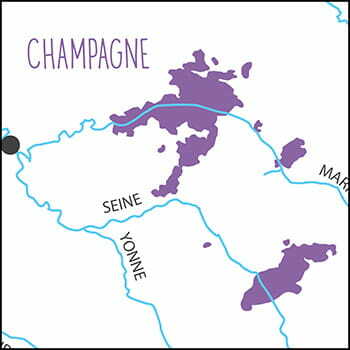 The Gerbais family has led the resurgence of the Aube since 1930. With an 18-hectare estate lying on the slopes of the Ource Valley in the village of Celles-sur-Ource, the grapes benefit from a unique river valley microclimate. With 10 hectares of Pinot Noir, and 4 each of Chardonnay and Pinot Blanc, the Domaine has met the stringent organic viticulture standards of AMPELOS since 1996. The young and supremely-skilled Aurélien Gerbais is now spearheading the winemaking. Embracing a terroir-driven philosophy, the vineyards undergo seléction parcellaire. The grapes are harvested carefully by hand and crushed in a traditional Champagne press. After a brief period of débourbage at a controlled, cool 12° C., alcoholic fermentation is induced in stainless steel tank over select organic yeasts. The wine, also in tank, naturally passes through malolactic fermentation, and is then bottled unfined and unfiltered.